Myanmar is known for pickling its tea and fermenting its porridge, for constructing the longest of bridges and largest of Buddha statues. It’s a destination full of distinct traditions, incomparable cultural diversity and perhaps the world’s emptiest capital city. Here are some of the most unforgettable adventures you can have while traveling in Myanmar. Wash down some fried field mouse with boozy coconut water. Toddy is a fermented drink made from the sugary sap of palm trees. “Toddy huts” serving this extremely sweet, potent beverage are more commonly found in rural areas of Myanmar. Toddy is often drunk from the shell of a coconut and alongside unusual eats such as fried field mouse. There are several toddy huts on the outskirts of Yangon, or try finding a few joints to pop in for a swig while biking around Bagan. 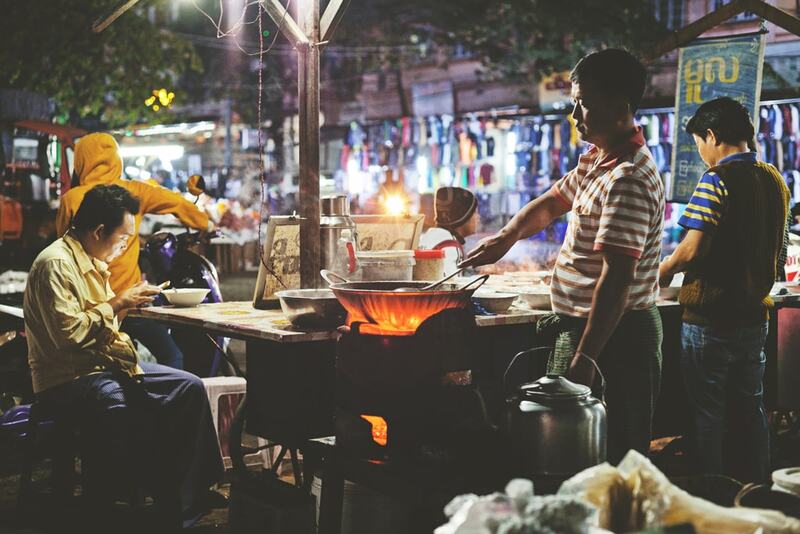 Fill up on fermented porridge at Myitkyina’s night market. The prominent city of Myitkyina in Kachin State, Myanmar, hosts a bustling night market with an array of steamy food, colorful produce and fragrant flowers. A warm bowl of kyat u kazaw (pronounced jet-oo kazaw) is what most locals go for, especially on chilly Myitkyina evenings. It’s a sweet, lightly fermented rice and egg porridge that promises to warm the taste buds right up and is totally worth the potentially long wait. Discover the details of Bagan from within its ancient temples. Step inside Bagan’s astonishing temples to discover new details and views of one of Myanmar’s most traversed sites. Many have narrow passages to navigate, steep hidden stairwells to climb up and windowsills to peek through. Not all of the temples in Bagan are open to the public; those that are often come with a groundskeeper who may or may not show all a pagoda has to offer. Watch lotus plants become beautiful garments at Inle Lake. Inle Lake in Shan State is one of the only places left in the world where travelers can experience the art of making gorgeous attire from the spun thread of cut lotus stems. This ancient practice has become a major tourist attraction for the area. There are several shops to observe lotus weavers in action, such as Khit Sunn Yin Lotus, Silk and Cotton Hand Weaving Center, while boating from village to stilted village. Ride over one of the world’s oldest, slowest railway bridges. Opened for transit at the turn of the nineteenth century, the Goteik Viaduct between Pyin Oo Lwin and Lashio in western Shan State, is a ride to remember. Trains slowly inch along the trestle that bridges a deep gorge for approximately half a mile. Catch the train from Mandalay to Lashio for under US$5 to experience this extraordinary engineering masterpiece. Meet generations of wooden loom weavers near Kalay. Traditional weaving is more than a job in villages near the city of Kalay in Myanmar’s Sagaing Region. It’s a livelihood passed on from generation to generation. Fly to Kalay from Yangon or Mandalay for a refreshing stay in one of Myanmar’s fastest developing cities and hitch a ride to more rural communities surrounding the city to see these wooden looms in action. The entire area was devastated by major flooding in 2015, and much of that destruction is still very visible today. Crunch on the inside of banana stems for breakfast. The inside of the flower stalk of a banana plant is a healthful and popular component of cuisine in tropical regions around the world. In Myanmar, it adds a slight crisp to mohinga — one of the country’s most popular breakfast dishes. And not only are banana stems tasty, they’re spectacularly designed as well. The real breakfast of champions! Hang out inside abandoned trains just outside of Yangon. Looking for an adventurous trek down memory tracks? There’s a train yard with plenty of abandoned cars to explore near the Insein stop along Yangon’s circular rail route. It’s perfect for travelers hoping to hop off the beaten rail for a bit. Several buildings at the site house train cars and engines under repair. Ask a railroad worker for permission to safely snoop about. Count the number of boards while crossing the world’s longest teak bridge. 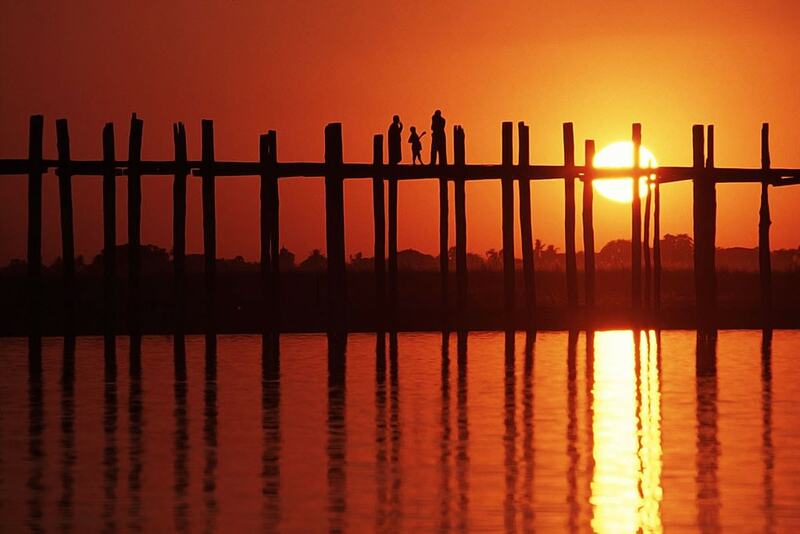 Not only is U Bein Bridge near Mandalay thought to be the world’s longest teakwood bridge, it’s also considered the oldest. Completed in the mid-1800s, U Bein stretches approximately 4,000 feet over Taungthaman Lake near Amarapura. It’s famous for monk sightings and sunsets — and monk sightings at sunset. Stumble upon fossils that are nearly 100 million years old. Imagine shopping for gems at a local market and stumbling upon a 99 million-year-old fossil within a piece of polished amber. This actually happened in Mytkinya, Myanmar. Although amber unearthed in various parts of the world has been found with entombed treasures, Myanmar’s amber mines and markets have recently made international headlines for being a potential trove of clues from prehistoric times. 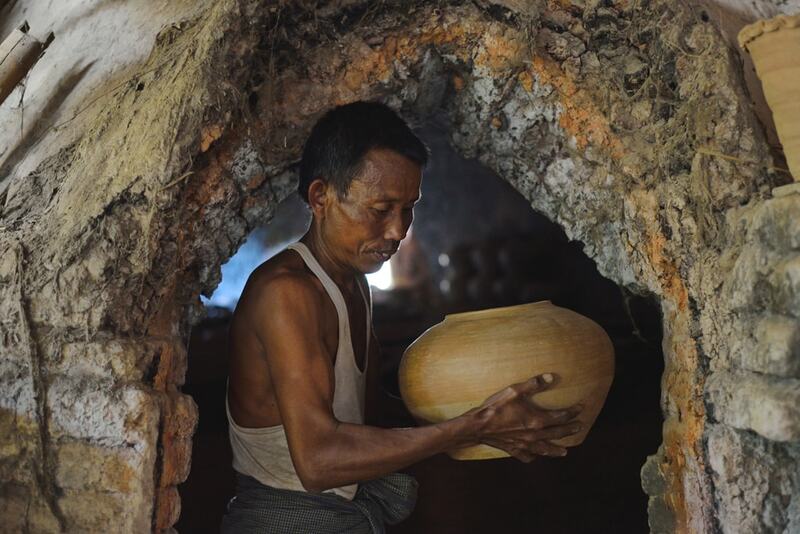 Learn how pottery is traditionally made in Myanmar. Pottery used for anything from storing water to making yogurt is handmade in Myanmar using simple age-old techniques and raw materials sourced from the Yangon Region. Learn how these beautiful, delicate pieces are created by going on a half-day journey across the river from Yangon. Catch a quick ferry from downtown to Dala for less than US$5 there and back. Once in Dala, negotiate prices with a taxi driver to be taken to the pottery factories in Twantay Township. Myanmar clay creations come in all shapes and sizes and are great souvenirs. Drink from community clay pots around Myanmar. Ready to see those handmade clay pots in action? It might come as a hygienic shock, but many people share the same cup and clay pot filled with water to drink from in public places around Myanmar. This tradition flows from Myanmar’s communal past. And while it may not be the cleanest source of water available, it does serve as quite the sight to sip in at least. Create fun facial designs with paste made from tree bark. Pro beauty tip from Myanmar: Don’t leave home without wearing thanaka. The thick, yellowish paste is mostly worn by women and children as a natural sunblock. It’s also known to have healing properties. Nowadays, this over 2,000-year-old Burmese art form is caked on faces in fancy swirls and silly patterns. Be on the lookout for thanaka to show up in the global skincare scene soon. Mail a postcard from a functioning colonial post office in Yangon. The main, central post office in Yangon was constructed during Myanmar’s colonial era. The ornate building has gone through some restructuring and neglect over the years but still maintains much of its original, magnificent facade. Plan to drop off some postcards while on a walking tour of downtown Yangon. Go round and round on a human-powered Ferris Wheel. In fewer and fewer areas of the world where electricity is too unreliable or scarce, human-powered Ferris wheels can still be found. These pop up during major events in Myanmar such as the Tazaungdaing Festival. Burmese men use their weight and strength to provide riders with a roundabout thrill. Manual Ferris wheels may be a more environmentally friendly mode of excitement, but they’re definitely not the safest job or for fainthearted fair goers. Go nuts for betel nut too. Betel nut mixed with traces of flavored tobacco could almost be considered a local delicacy in Myanmar. It’s the chew of choice for many, and just one stimulating bite might get tasters hooked. To keep up with nationwide demand, makeshift shops with workers sorting through what’s also referred to as areca nut are often nestled between residences in neighborhoods. Stop by, squat a while and ask to try some. Dive into a nationwide water fight. Myanmar isn’t the only country to splash in the Buddhist New Year with consecutive days of drenching and getting drenched by all those encountered along the way. However, celebrating the Thingyan Water Festival, or Burmese New Year, comes alongside waves of traditions unique to Myanmar. Huge water stages and sticky rice balls filled with a lump of jaggery or a spicy pepper are a few. The wetness happens in April of every year; staying dry isn’t really an option. Drink your tea and eat it too. Tea plays a very important role in Burmese society and cuisine. Tea is served at all times of the day, in restaurants, in homes — and not only to drink. Pickled tea leaves (lahpet) are usually eaten in the form of a salad, and to travel to Myanmar and not dine on lahpet thoke (tea leaf salad) would be like going anywhere in Asia and not consuming rice. It’s a staple. Visit Myanmar’s seemingly deserted capital city of Nay Pyi Taw. The capital of Myanmar was moved from Yangon to Nay Pyi Taw in 2006. The city swap was met with a lot of controversy, but a more centrally located spot for government offices was desired. Nay Pyi Taw is known for having unnecessarily wide highways, seemingly empty shopping centers and mostly vacant luxury hotels. But the city is actually ideal for a quiet weekend getaway. 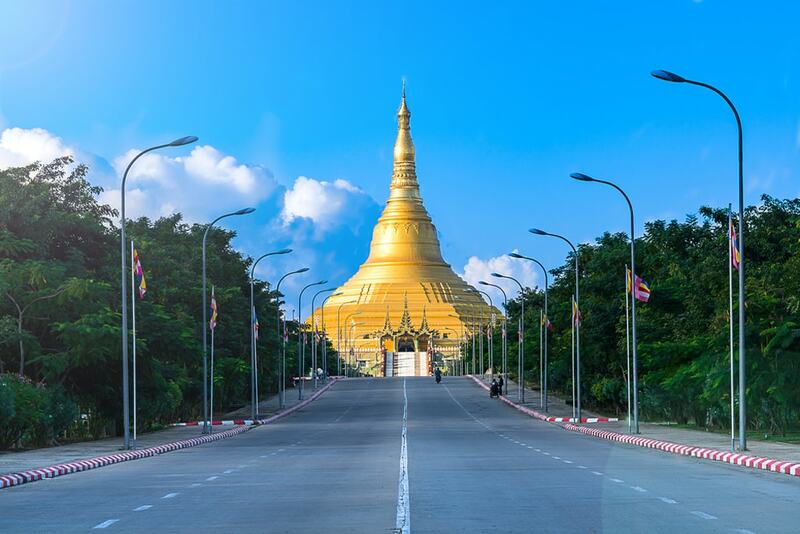 Be sure to stop by Uppatasanti Pagoda — a nearly exact replica of Yangon’s Shwedagon Pagoda. Go inside a massive reclining Buddha in Mon State. Approximately 15 miles south of Mawlamyine in Mon State, Myanmar, rests one of world’s largest reclining statues of Buddha (if not the largest). Win Sein Taw Ya lounges almost 600 feet across forested hills surrounded by a complex of pagodas and shrines including hundreds of statues of monks leading up to its entrance. Venture inside to experience its somewhat bizarre dioramas of Buddhist teachings. Observe intimate aspects of Myanmar Buddhist culture everywhere. Buddhism is by far the most practiced religion in Myanmar, and nearly all aspects of Burmese culture have been shaped by Buddhist beliefs. It isn’t unusual to witness a long line of monks or nuns going from door to door asking for donations or to be invited to a traditional head shaving ceremony when a citizen enters the monastic way of life. It’s customary for all Myanmar Buddhists to be a temporary monk or a nun at least once in their lifetime.